Here is a good song by the exciting Gale Garnett. Gale Zoë Garnett (born in 1942) is a Canadian singer known for her Grammy-winning folk hit "We'll Sing in the Sunshine". Garnett has since carved out a career as a writer and actress. Garnett was born in Auckland, New Zealand. When Garnett was 11, her family moved to Canada, and she made her public singing debut in 1960, while at the same time pursuing an acting career making guest appearances on television shows such as "77 Sunset Strip". In the fall of 1964, Garnett scored a Top 10 pop hit with her original composition "We'll Sing in the Sunshine", and recorded her debut album, "My Kind of Folk Songs", for RCA Victor. Riding the success of that hit, which won a Grammy for Best Folk Recording, Garnett continued to record through the rest of the 1960's with her backing band the Gentle Reign. Although Garnett retired from the music business by the 1980's, she has also continued appearing in feature films and on television shows, usually in supporting roles. In subsequent years, she also branched out into journalism, writing essays, columns, and book reviews for various newspapers and magazines. 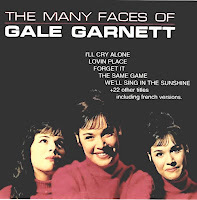 Enjoy Gale Garnett's warm voice!